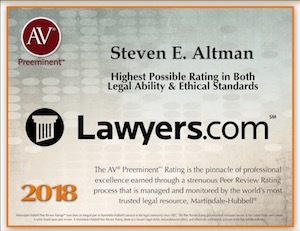 Steven Altman is the managing partner of Altman & Altman LLP. Steve is a 1989 graduate of Trinity College where he received his Bachelor of Science in Economics. He received his Juris Doctorate from Suffolk University in 1992. He is a member of the state and federal bar of the Commonwealth of Massachusetts. Steve’s practice primarily focuses on civil and criminal litigation. He has handled a number of complex civil matters, including wrongful death claims, traumatic brain injury cases, premises liability injury claims, medical malpractice, motor vehicle accidents, defective products claims and other catastrophic injury claims. His artful negotiating has helped the firm collect millions of dollars in settlements and case verdicts for his clients. In addition to maintaining a busy civil litigation practice, Steve also helps manage the firm's growing criminal defense practice. Steve along with Samuel Goldberg Esq., Steven Goldwyn Esq., Richard Floor Esq., and Asia Fitzgerald Esq., handle the firm’s Criminal litigation practice. This talented team of litigators have handle criminal matters as minor as a traffic ticket to the most serious of criminal felonies. This group is also available around the clock to ensure the firm’s clients’ needs are always being met. Steve knows that the role of attorneys and law firms has evolved over the years –It is no longer a 9-5 business. Being able to communicate with his clients at any time allows better lines of communication with his clients and that leads to better representation and better results. His cell phone number is always given to his clients. He’s always available for his clients whether they have an issue in the evening or during the weekend he’s always available to make sure his client’s needs are met. 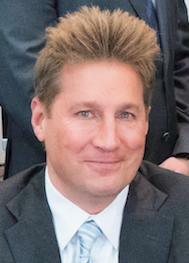 He is a contributor to all of the firms legal blogs, some of which have been nationally recognized. In addition he is a legal contributor to Discovery Channels’ – Investigation Discovery’s Breaking Point. He is a member of American Trial Lawyers Association, Massachusetts Academy of Trial Lawyers, Massachusetts Bar Association, American Association of Justice. He is also involved in numerous local charities including The Jimmy Fund and The Pancreatic Cancer Action Network. Steve is a little league coach, a youth basketball coach and a fan of all sports. He will occasionally still lace up his sneakers and play some hoop. "Steve Altman handled a very sensitive case for my family most recently and I could not have been more pleased with the outcome. His firms service is analogous to a concierge for legal services. We got the information he needed and we were on auto pilot ever sense. Each detail was handled by his firm and we need not do anything except follow directions. 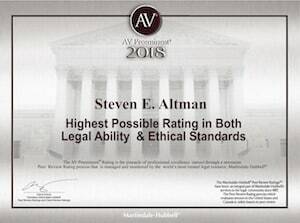 We have used Altman and Altman for many of our family's legal matters and he has now become the family attorney. We trust him and have great confidence in his abilities to address the most important legal matters that our family has had to deal with. 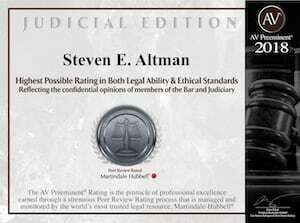 Without reservation, I strongly recommend Altman & Altman LLP."